Loved it, and I am just glad to see Ward is back! I know some complain that the series is becoming more urban fantasy and not stand-alone romances, but I love the Brotherhood and there was so much romance in this one I couldn't complain at all. Rhev and Ehlena were great and got plenty of page coverage. I was happy as can be that the story included all the different characters too, so it wasn't just about Rhev and Ehlena. Loved how things are changing for the Brotherhood and all the guys personally. 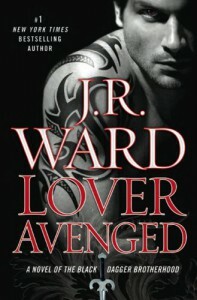 Loved the writing style and pacing of the story, Ward has clearly nailed it. I can't wait for John/Xhex story!